Not the first novel in verse I’ve read but certainly one of the best. Will is a teenager who has just lost his older brother in a shocking act of violence. 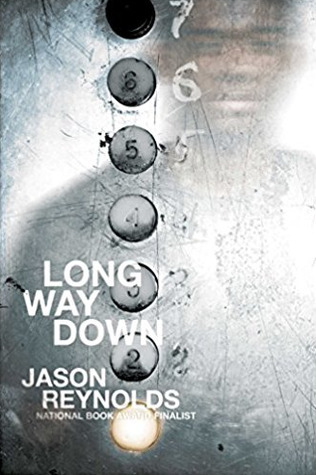 The morning after, he finds his brother’s loaded gun and gets on his building’s elevator, going down, in pursuit of his brother’s murderer to kill him. At each floor, the elevator stops and a different person from Will’s past “gets” on, imploring him to think about his choices before it’s too late. It’s a fascinatingly interesting story, one that I think I actually respected more for the fact that it was written in verse–extraneous details skipped, only the bare bones here. It’s 300 pages or so but only took a couple of hours to read. The ending was a bit confusing, but after several reads I came to appreciate it for what it was–completely and superbly ambiguous to the reader. As a former teacher I can see this being used in middle or high school classrooms, because there’s so many dialogue and discussion possibilities present with this book. It takes place during anytime and anyplace and anywhere and doesn’t offer any easy answers. Despite inevitable criticism to the contrary, I don’t see why this book should make the problem of violence a simple one, as everyone knows that it’s a complicated cycle that repeats itself over and over again. It’s also great reading for adults like me, I loved this book immensely. This novel sets a pretty high bar for all other YA poetry books, which is good because I am starting to feel that this form of story-telling is becoming somewhat over saturated. Definitely recommended.